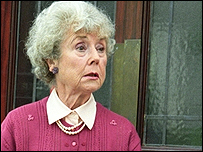 Family and friends of former EastEnders actress Hilda Braid have paid their tributes to her at her funeral. Braid, who played Victoria "Nana" Moon in the TV series, died aged 78 at the Royal Sussex County Hospital in Brighton, earlier this month. 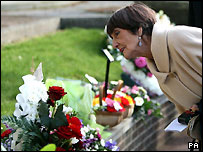 Fellow EastEnders actress June Brown, who plays Dot Branning, joined mourners at Woodvale Crematorium in Brighton. She said the pair first met 50 years ago, and she would be remembered as a "cheerful, witty, well-read" actress. Braid, who was born in Northfleet, Kent, starred in the BBC soap from 2002 to 2005. Her other TV credits included Citizen Smith, Casualty, and Man About The House, along with several roles in the theatre, including work with the Royal Shakespeare Company. The mother-of-two died on 6 November after a lengthy battle with dementia and Alzheimer's. Her white coffin arrived at the crematorium on Sunday in a white horse-drawn carriage with a wreath spelling out "Nana". Another flower tribute came from the cast and crew of the show, and read: "You were a delight to work with and brought such joy to your colleagues and many fans as the wonderful Nana Moon. "May your dear soul rest in everlasting peace." The congregation of about 100 people joined a brief service, which ended with the EastEnders theme tune. June Brown told mourners she would remember her friend as "this bright dark-haired young cheerful, witty, well-read, educated, intelligent, left-wing actress and a very good straight actress".